October 13, 2011 by Alphageek in "alphageek", "review", "urbanspoon"
October 7, 2011 This restaurant was an amazing find. Mrs. Alphageek found this place while we were driving to a football game. She used the smart phone sleuthing technique. She read some very generous praise for Thai Siam Take Out. With praise this high, we expected a meal on par with some of the best dining experiences we have ever had. Given that we were in the foothills of Virginia (in Nelson County) did make us pause, but we are all for adventure. So, excellent reviews in hand, we headed out to give Thai Siam Take Out a try. This article is a little more Alphageek than usual. This article is packed full of information, so try to read all the way to the end, if you are interested in finding out more about Thai Siam Take Out. We started out with some spring rolls. I happen to know that these were made freshly, just for us. How do I know? I simply watched our spring rolls being made, right there on the spot. When our rolls arrived, we were simply not prepared for just how unique and fresh the accompanying peanut sauce would taste. 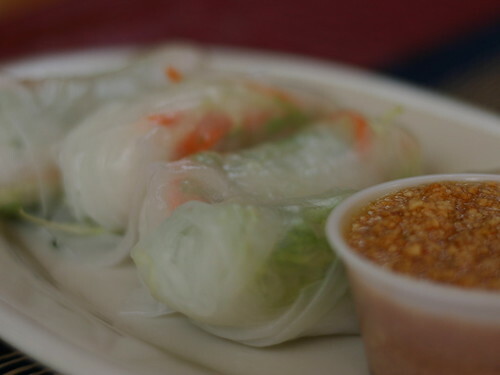 The peanut sauce pushed a great spring roll over the top, and set the stage for some great expectations for the rest of the meal. Next up was something called Plah Goong. 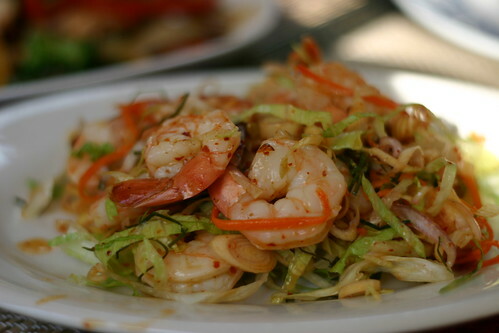 The menu simply states that it is steamed shrimp with: lemon juice, onions crispy red onions and spring onions. As I write this, I realize for the first time that this is not exactly what we got. What arrived was a little different. The dish had some lemongrass slices, perhaps some fish sauce, vinegar, lettuce and some kaffir lime leaves. At least that is our guess. You can take a look at the picture below and see for yourself. The reason we never noticed? This was simply one of the most amazing appetizers we have ever had. Besides, substituting is great, when substitution yields a dish this fresh and unique. The flavors again all tasted as if they were made there, right in the kitchen that morning. At this point, the expectations are off the chart. We began to wonder what we would think of what arrived next. Quickly, our curiosity was rewarded in a big way. Basil Chicken came out. Before we even took one taste, something jumped out. There was a much larger proportion of vegetables to meat than one usually sees. This gave the dish great visual appeal, through the great multitude of colors. The multitude of colors set the stage for some great flavors. I could keep droning on, using superlatives, but instead one word: best. This is the best interpretation of Chicken Basil I have ever tried. Fresh? Yes that was there too. 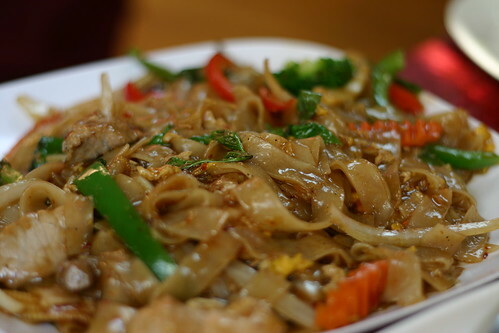 The Drunken Noodles below? The same simple gushing applies to this dish as well. I will let you just take a look at the picture for this one. At this point, I think Mrs. Mae, who may be the owner but at least runs the front side of the house, asked if we like hot food. I guess she noticed everything we ordered is a traditional spicy dish. I replied that I loved hot food. She then brought us some hot sauce. She told us it was made from cilantro, garlic Thai peppers and Serrano peppers. The hot sauce had a bite at the front of the mouth that was amazing. I found that it released even more amazing flavors from every dish that was on the small table before us. The sauce must have been pretty hot, because it was more than Mrs. Alphageek could handle, judging by the fire in her cheeks. Mrs. Mae laughed and departed, only to quickly return with a small cucumber salad to cool the fire for Mrs. Alphageek. Finally, we got to try Gra-Timm Prik Thai. The menu simply says "sliced meat season w/garlic and black pepper". That might be the most understated menu description I have ever read. 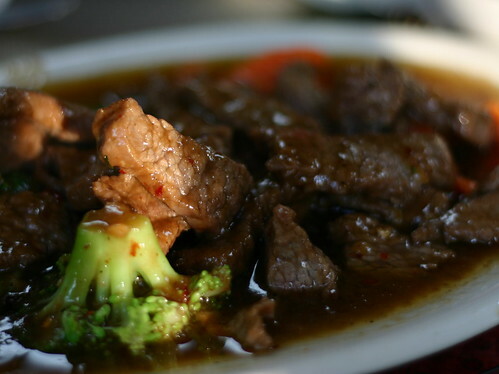 This dish has a deep, dark flavor that is difficult to describe. The sauce has the taste of something that has cooked very carefully, for a long time, to develop the many levels of flavor. Usually, a dish like this will taste slightly burned, in an attempt to speed the cooking process. That speed is not evident here. This attention to detail is what makes this dish amazing. After the meal, Mrs. Alphageek asked if she could get mangoes with sticky rice. They do not have the dish this time of year because mangoes are not in season. It is this devotion to food and season that was evident in every dish. The Alphageek respects someone who will only do things the right way. It is at this point I would usually close with a simple remark that shows a map, and some directions on how to get there. Today, there is going to be some more opinion than usual, followed by some useful information. As Mrs. Alphageek and I left, we talked about something important on a food web site. Did we just eat the best meal we had ever had? Not just the best Thai, but the best period. The respect for the food as the star shows right away. The menu states that some items may not be available, if they sell out that day because everything is made on site, freshly, every day. From what we sampled, this statement is entirely true. From a simple kitchen, emerges some of the most amazingly well-prepared food I have ever eaten. The Alphageek likes to cook, and I would be entirely proud to have the skill to cook like what we enjoyed. We certainly did not expect the best food ever to emerge from a small, modest building in the foothills of Virginia while driving to a football game, but that is what happened. Mrs. Alphageek wins kudos for using smart phone sleuthing to find some of the best food we have ever had. This find makes that data plan well worth the money. 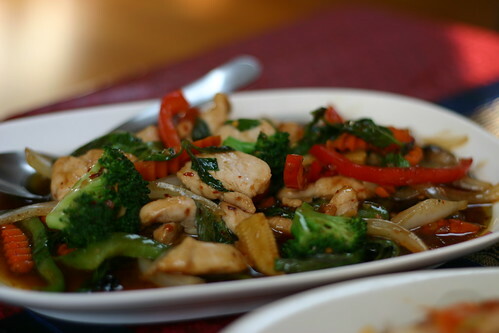 So, you have read this gushing review and you want to try Thai Siam Take Out for yourself. You have come to the right place, because the Alphageek was paying attention while eating, and has some tips for you. First, keep in mind they close early. They are out in the country, and people go home early. If you come in at 655 pm, that might be a problem. They close at 7 pm, so keep that closing time in mind. You should probably just call ahead and make certain they are going to be open, and go ahead and call in your order ahead of time. They get very busy with take out orders, and the eating area is not very large. The number is below, on the map link. You can also click here for a menu, and here for the second page of a menu. They also have a vegetarian menu that you can see by clicking here. You should also keep in mind that they are closed Sunday and Monday, but you should always call and make certain they are open the day you want to stop by. Also, keep in mind they make pretty big portions. Make sure you bring your appetite with you, or bring a hungry friend. As always, your feedback is most welcome. Tell us if you think this is a great place!